The concept results in a very asynchronous design. The robbers will be spending their turns buying equipment and raising funds and generally planning for the heist itself. Meanwhile the bank is improving security; upgrading locks, installing CCTV cameras and hiring more guards. The longer the robbers spend planning the more time the bank has to improve security so there is a beautiful balance between taking your time to plan the perfect crime (hence the title) and just shout out 'balls to it, we're going in" before the bank becomes a virtual Fort Knox. Once you decide to enter the bank then Perfect Crime switches to a tactical board where the game becomes a combination of stealth and tower defence. The robbers must move carefully through the bank, avoiding guards, bypassing CCTV and getting through locked doors. At the beginning the bank player is powerless, simply moving guards over pre-determined routes, but whenever the robbers do something iffy, like sneak around too much or override the CCTV, then they generate suspicion tokens. Enough suspicion tokens and the bank can raise the alarm, calling the police and giving him more control over the guards. Alternatively the bank player can trade in these suspicion tokens to change guard routes and other instant ways to try and stop the robbers’ movement. It all worked really well and even though I only played a small section of the game the clever design was shining through. It generally takes 3 heists to complete the full swag and as the game progresses the bank's security will keep getting tighter and tighter, meaning players have to spend longer planning and so are presented with a greater risk that the bank will have tightened security even further. The heist itself is wonderfully tense. My favourite aspect was that moving slowly raised suspicion (why are those bank employees just hanging around?). This meant that careful movement to avoid a guard can often give the bank player more power to stop you. My one gripe with the game, although it’s more a query on how the game is supposed to be played, is that I wasn’t sure how much information was secret and how much was open. The game felt like it would work best when the bank player does not know what the robbers are planning, that way he or she would have to anticipate the potential avenues of approach. With too much open information the bank will just try and counter the robbers directly. The game we played was an early prototype and even with makeshift components and simple cards Perfect Crime held a lot of promise. The blend of planning versus push-your-luck and speed versus stealth meant there are potentially many different ways to approach the heist, from sneaking in silently to ram-raiding the building with a mini-gun. There also looked like plenty of opportunities for varied and layered security systems, meaning that each game could be very different. 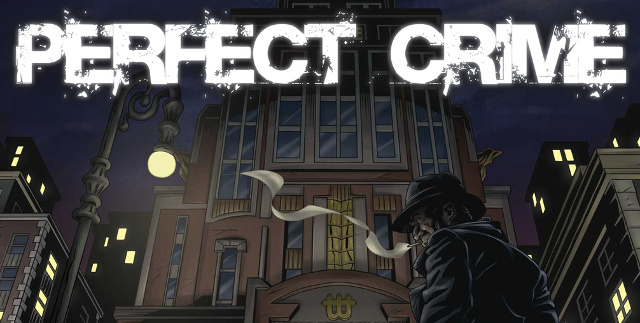 Go check out Perfect Crime on Kickstarter now.